"I received this recipe from a dear neighbor many years ago. 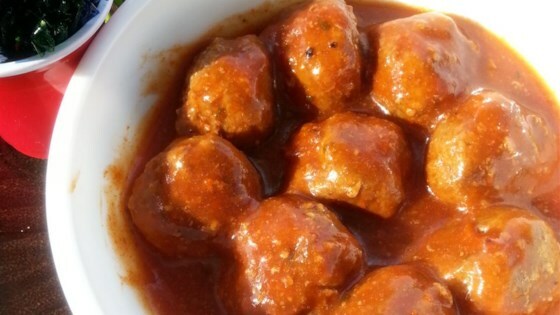 The meatballs are very good and easy to make and the sauce ingredients are items that you would normally have on hand. If you have the meatballs, you can whip up this appetizer in a snap." Preheat oven to 325 degrees F (160 degrees C). Place meatballs in a casserole dish. Bake in preheated oven until warmed through, about 10 minutes. Combine ketchup, brown sugar, vinegar, Worcestershire sauce, mustard, cloves, garlic salt, and beef bouillon cube in a saucepan; bring to a boil, stirring often. Reduce heat to low and simmer for 5 minutes. Pour sauce over meatballs; cover dish with aluminum foil. Continue baking in oven until meatballs are hot, about 20 minutes. Accidentally bought Meatless Meatballs - no one knew. Turned out great. I also did them in a slow cooker for a couple hours.